VividCortex is the best way to see what your databases are doing in production. VividCortex supports MySQL, PostgreSQL, Redis, and MongoDB. One of our core principles is that servers exist to do work (queries), so work is the most important thing to measure and analyze. This is the difference between VividCortex's performance management platform, and "monitoring" tools that just show you charts or alert on thresholds. We measure queries and their behavior, not just status metrics. We make it easy to monitor any number of instances, from one or two, to hundreds or thousands. We help developers see how their code works with the database, without needing to bother DBAs or operations staff. We make DBAs and operations staff more efficient when they're needed. We use sophisticated visualizations to help you understand lots of data quickly. We offer high-resolution data (1-second granularity) for unprecedented visibility. The VividCortex application consists of an agent running on your servers, and our cloud-hosted application. The agent is simple to install, efficient, and self-managing. Plugins generate metrics and events from network traffic, the database server and the operating system. 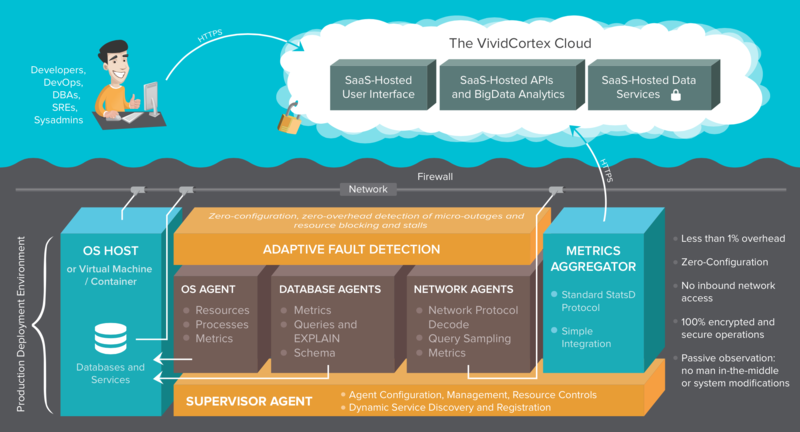 The agent sends the metrics to our APIs securely, and you access the web application at https://app.vividcortex.com. The following image demonstrates how it works. Click for a larger version. VividCortex is a multi-tenant cloud-hosted service. Your data is secure with VividCortex. Your data is stored separately, not intermingled with other customers. We encrypt all API traffic over SSL, strip out literals and identifiers, and store all sensitive information highly encrypted at-rest in our servers. We have more information about how VividCortex keeps your data secure if you are curious. If you have any questions, please contact us using the chat icon in the bottom of the VividCortex application. To check the current status of the VividCortex app visit our status page: https://vividcortex.statuspage.io/.